Tamil Tiger rebels in Sri Lanka have buried one of their top leaders, three days after he was killed in a bombing raid by the military. Thousands of mourners turned out to pay their respects to SP Thamilselvan in the rebel-held town of Kilinochchi. 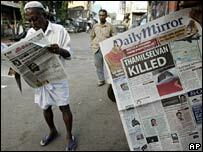 Mr Thamilselvan was the Tamil Tigers' public face and the most senior rebel to be killed by troops in years. There are fears the killing could lead to a further escalation of the war with the rebels, who want a Tamil state. Correspondents say the death will be a huge blow to the rebels. 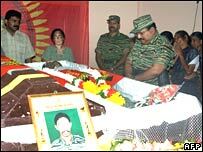 Rebel fighters in uniform carried the dead leader's flower-strewn coffin through the streets of Kilinochchi as crowds looked on. Have your say - what now? Mr Thamilselvan had led the Tamil Tigers' peace wing and taken part in peace talks with the government before the slide back to war. The government, which controls access to rebel-held territory in north-east Sri Lanka, refused to allow journalists to cover the funeral. They also prevented Mr Thamilselvan's mother from attending, the rebels said. In Colombo, the government vowed to continue its fight against the Tamil Tigers. Prime Minister Ratnasiri Wickremanayake warned of a "relentless pursuit of terrorists". Government spokesman Keheliya Rambukwella told reporters Mr Thamilselvan was no "peace dove", as the rebels' top leader described him. "He was a fighter earlier. In recent history he is the one who sabotaged the peace talks," Mr Rambukwella said. Top rebel leader Velupillai Prabhakaran made a rare public appearance over the weekend to mourn the man many saw as his deputy. He said the death was an "unparalleled loss". Observers say the two sides now seem to be gearing up for a major confrontation in the north of the country. The rebels are fighting for autonomy for minority Tamils in the north and east, claiming discrimination by the majority Sinhalese population. About 70,000 people have died in more than 20 years of war.